Entries for riders under 18 need to be made via the parent account. If the rider and parent already have accounts using the same email address but different passwords then the accounts should link automatically. If they don't you have a couple of options. Click REQUEST TO NOMINATE button and yo will get a pop up asking for the name of the person. Put in the parent name. 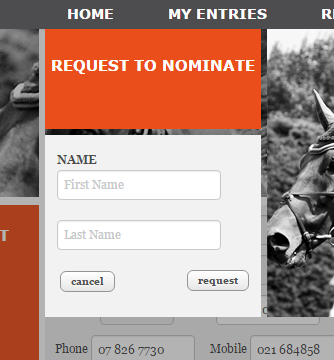 This will only be successful if the person you are nominating has an Equestrian Entries account. It is not instantaneous and may take 24 hours to be processed. 2. Use the webchat to ask for the accounts to be linked. Once again this will only be successful if both the parent and child already have accounts with Equestrian Entries. Once linked you can instantly make entries from the parent account. Posted by: Vicki Lawson - Wed, Dec 14, 2016 at 1:47 AM. This article has been viewed 4634 times. Filed Under: Creating an Equestrian Entries account.